The Dell EqualLogic PS4100XV SAN Storage Array is an ideal SAN for any SMB looking to find a balance between performance, capacity, and cost in their storage array. With the easy to understand management, integration with VMware, and high performance we expect from the EqualLogic PS Series, the PS4100XV also offers up to 12 hot swap 10K SAS 2.5” hard drives and a maximum capacity of 7.2TB. This SAN makes it an ideal solution for application storage, failover for virtual instances , and archiving. It also comes standard with Dual 2-Port 1GbE iSCSI controllers. Aventis Systems offers a 3 Year Essentials warranty on all Dell EqualLogic PS4100XV SAN Storage Arrays with optional Secure Drive, Extended, Express, and Onsite warranty upgrades. So shop below and find the perfect EqualLogic PS4100XV Storage array to balance your storage and performance requirements! 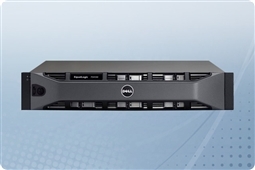 Curious if the Dell EqualLogic PS4100XV SAN (Storage Area Network) arrays are right for your business continuity and budget? Check out our Survival Guide: Avoiding A Data Apocalypse today! Expansion Capabilities: Can be combined with other EqualLogic PS Series arrays in the same SAN group, online. A maximum of two PS4x00 arrays can be in a group. 7.2TB (12 x 600GB) 15K 6Gb/s NL SAS 3.5"